Timber Decking Busselton – At WA External Solutions we take pride in our work and here is an example of one of our 140mm Merbau Decking jobs recently completed in Busselton. We offer timber decking from South of Mandurah, Through Bunbury to Busselton, and including Dunsborough, Margaret River and Cowaramup. For an obligation free quote please call the friendly team from WA External Solutions on 1300 660 978. And for that little bit of difference we also offer Timber Patios, which can be lined and could be a fabulous addition to any home. 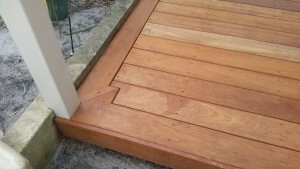 our team of Qualified Carpenters can customise a timber patio for you needs.